Lughnasadh is also known as Lammas, First Harvest, Bread Harvest, Feast of First Fruits, and Gŵyl Galan Awst (Welsh). Lughnasadh is the first of the three harvest festivals (the other two being the Autumn Equinox and Samhain) for Pagans following the Wheel of the Year. 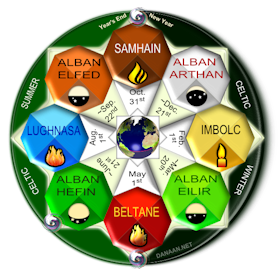 Lughnasadh is also the final fire festival of the Celtic year (with Samhain, Imbolc, and Beltane being the other three fire festivals). In northern Europe this time of year ushered in a season of plenty, and hard work in the company of your neighbors bringing in the crops. Lughnasadh (or Lunasa in Modern Irish) occurs about August 1st in the Northern Hemisphere. This festival marked the beginning of the grain harvest, and included sacrifices to petition for a bountiful season. Falling six months opposite the winter festival of Imbolc, Lughnasadh is conversely at the middle of summer, a festival of the light half of the year, and with more masculine activities such as large regional outdoor gatherings, trade, games, law making, and forums (Freeman 2001, OBOD 2001). Lughnasadh ushers in the harvest season, and the people rejoiced in this bounty. While Lughnasadh shares the lighting of bonfires and visiting of holy wells with the other Gaelic festivals, ceremonies to the tops of hills or mountains were common. Often these became known for the berries picked along the way (Freeman, Pg 243). 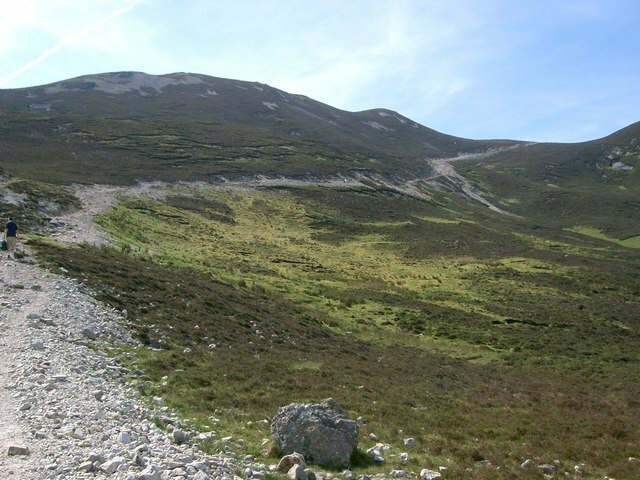 Pilgrimages to hilltops occur in Ireland – the most well-known being Reek Sunday—the yearly Christian pilgrimage to the top of Croagh Patrick in County Mayo in late July (Lughnasadh- Wikipedia). ‘Summer’ festivals start in August, and echo the harvest festivals of days past. One example is Das Awkscht Fescht (the August Festival) a 42 acre automobile show, flea market, and weekend festival in the town of Macungie Pennsylvania. In rural agrarian areas there are still auctions and gatherings in August (before the major corn harvest gets underway) in southeast Pennsylvania. The Carrickfergus Lughnasa Fair in Ireland is part of a grand old historical tradition with deep roots, that go back to before medieval times, straight into pre-Christian history. According to Irish mythology, the festival was initiated by the sun-god Lugh as a funeral commemoration of his foster-mother, Tailtiu (Freeman, pg. 237; OBOD). Lammas origins inlcude the Anglo-Saxon Lughomass (‘loaf-mass’, or mass in honor of the god Lugh), and the Old English hlaf-maesse (loaf-mass) for a feast when a loaf made from the new crop of grain was taken to church for blessing. Pagan traditions include themes of the sacrifice of the corn (grains) god, and petitions for a fruitful harvest (Wigington). At Teltown in Ireland, the Lammas fair was a time of year for handfasting or trial marriages. Young people would choose a mate without seeing them, and be married for a year and a day. At the end of this period they could dissolve the “Teltown marriage” (Freeman, pgs. 239-240; OBOD). In the version of the Ogam tree alphabet calendar popularized by Liz & Colin Murray (1988), the tenth lunar ‘month’ of the year is in August. This period ushers in Lughansadh, when daylight is noticably decreasing after the Summer Solstice. The Ogam tree associated with this month is the grape vine (in warmer climates) or bramble (blackberry), or as the Ogam letter Muin. It represents strong growth, the joy of new crops, and release of constraints. The Green Man is a vegetative deity often depicted in Europe with ivy or grape leaves about or making up his face. He can represent personal transformation, or rebirth. The vine was used as a decorative design on Bronze Age items, and is still common. The picture here is of a ‘wedding basket’ from my grandmother. Attend a summer fair – join your community in the celebration of the season at renaissance faires, highland games, and at county or other fairs. 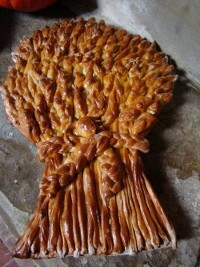 Bake a Lammas loaf, or similar celebratory breads to celebrate the new harvest. Feast with your friends – using foods symbolic of the harvest. Support your local farmers – at farmer’s markets, or at farming related events like hay rides, food festivals and the like. Buy and use locally produced food. Meditate on the harvest – dance in a field with tall grass. 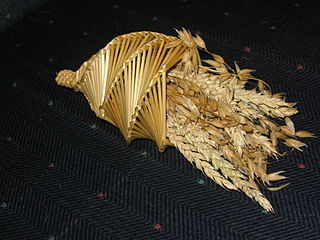 Make decorative wheat weavings – harvest knots or ‘corn dollies‘ can be made with wheat stalks. Contemplate your ‘harvest’– reflect on how the year’s hopes and dreams are maturing, and what fruit they will bear. Das Awkscht Fescht (n.d.) Retrieved from the Das Awkscht Fescht website. Eilthireach, (November 17, 2012) Deeper into Lughnasdh. Retrieived from the Order of Bards Ovates and Druids website. Green Man (2014) in Wikipedia. Lughnasa Festival at Carrickfergus Castle (2011), Retrieved from the Culture Northern Ireland website. Morgan. Lughnasa: Festival of the Harvest (A Druid’s Perspective) (July 17, 2011) Retrieved from Witchvox. Order of Bards Ovates & Druids. (2001). Lughnasadh Ceremony of the Order of Bards Ovates & Druids. East Sussex: Author. Wigington, Patti (n.d.), All About Lammas (Lughnasadh) – What is Lammas? – How to Celebrate Lammas, Retrieved from Pagan Wiccan About website. This Lughnasadh page was originally published on 7-24-2013, with many revisions since then.